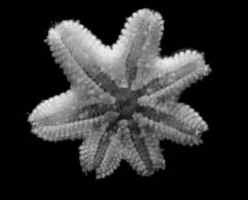 Related Articles: Asterina Stars, An Introduction to the Echinoderms: The Sea Stars, Sea Urchins, Sea Cucumbers and More... By James W. Fatherree, M.Sc. ID please - some sort of star? 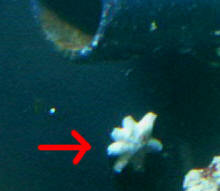 - 06/04/08 Hello, <Hi> I found this thing in the tank - it is approximately 1/4" in diameter, perhaps 3/16". I used a macro lens to capture it up close. I do not know what it is - my tank is approximately 3 weeks old and this is the first time I've seen it. The lights were on and had been on for 8+ hours so it apparently isn't afraid of lights. <Nice picture.> Any idea what it is? If I should remove it, how should I pull it out? I assume it is not safe to handle without using tweezers, etc. 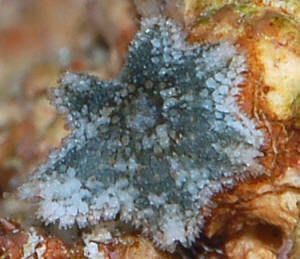 <It looks like an Asterina star. 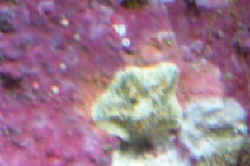 See http://www.wetwebmedia.com/asterinafaqs.htm . Some report problems with them, when they occur in large numbers and use Harlequin shrimp http://www.wetwebmedia.com/harlequinshrimp.htm with all the associated problems to get rid of them. 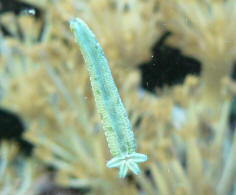 However, they behave well and are very beneficial in the majority of reef tanks. I would leave it in there. They can be touched or collected with tweezers or hands.> Thanks again for the great website!